Some types of yachts are described as the Italian version of something, mostly meaning they are adapted to the Mediterranean life – and yachting style, but sometimes their popularity vanes in favor of the actual Italian type. In the past few years, trawlers have been completely pushed off the Mediterranean market by their Italian version – the navetta. 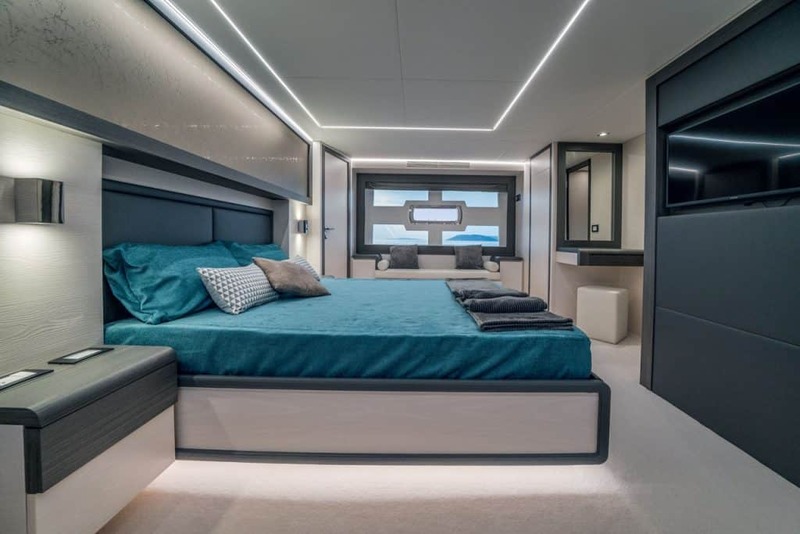 Shipbuilder Raphael have hopped on the navetta train and have invested all their know-how used to build the attractive and popular Marco Polo trawlers into navettas, aiming to – according to their Sales Director Angelo Guazzotti, create a yacht that will allow owners to reclaim their leisure time. The first and so far the only model in the new navetta range Raphael is Raphael 65, which we tested in Cannes last year. 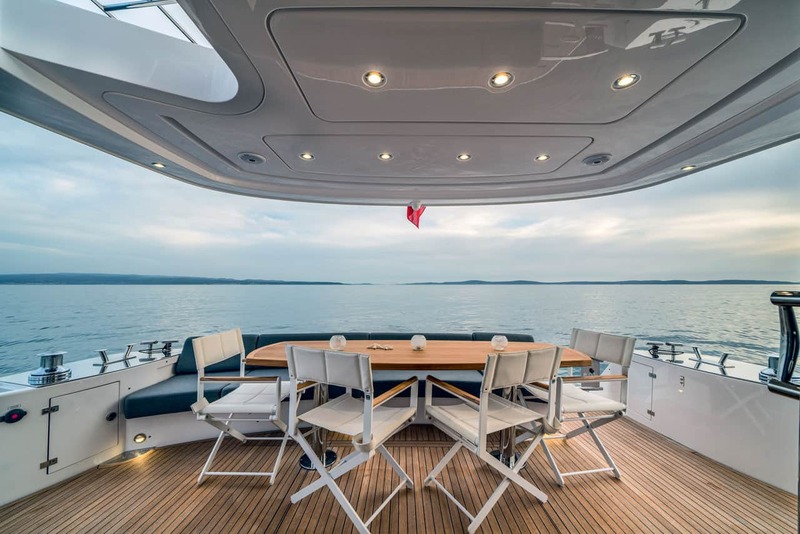 Elegant exterior lines follow the Italian recipe: they are soft, pleasing to the eye and classic, built around the large and seemingly never-ending glass surfaces of the main deck. The straight and fine bow contrasts the sturdy, wide aft, guaranteeing excellent fuel economy, as we have discovered on our test. At first glance it is obvious Raphael designers have spent most of their working hours creating unbelievably comfortable exterior spaces: the aft entrance to the main deck salon is protected by the fly deck, which looks like a lovely little rounded balcony, the bow offers an intimate little salon whose sofa turns into a sun-mat, and the fly bridge itself is one large salon with a semi-circular sofa and a hard top with a foldable fabric middle part. Inside we have discovered more of the same: a cozy and well-sized salon bathed in natural light, a galley and a dining corner furnished with light-colored elements that add to the feeling of spaciousness. The galley is located starboard, and can be completely closed from the rest of the yacht, but has large windows so the chef doesn’t have to miss out on the view. The command post is in the bow and is an interesting looking space reminiscent of fighter plane cockpits: there is only one chair, for the skipper, and the visibility is unparalleled. The skipper also enjoys excellent visibility toward the aft, as the command post is elevated, and can access the deck via a dedicated door serving the command post only. On the left side of the command post begins the staircase leading below deck, toward the hall serving the three cabins. The VIP is in the bow and has a double bed, the double guest cabin is aft, and the owner suite is located centrally, and has a double bed and uniquely shaped, recognizable windows. The master suite has a private head and a large wardrobe. 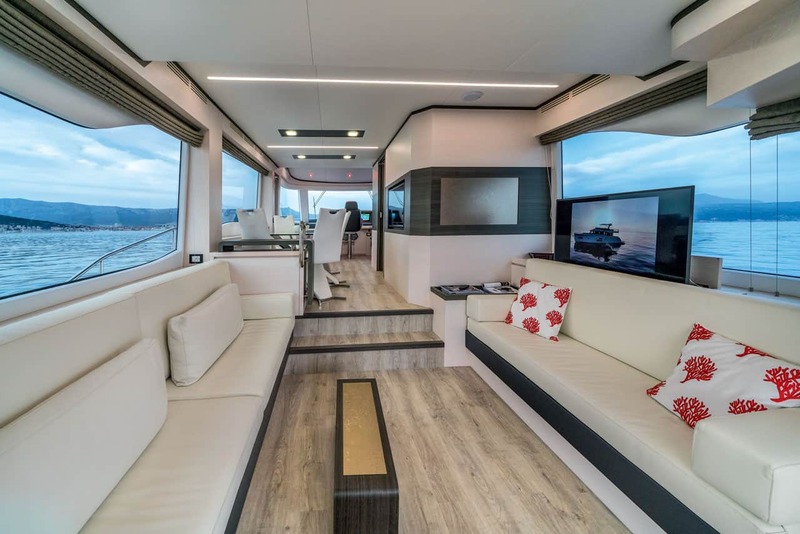 The unusual hull form of Raphael 65, especially the unique bow, has its advantages and is far from being a purely aesthetic choice. Powered by two MAN i6 (730 HP), Raphael 65 reaches 8 knots of speed at 800 rpm, using nine liters of fuel per engine. At 1000 rpm the yacht reaches 10 knots (cruising speed) and uses 18 liters of fuel. On our test Raphael 65 reached top speed of 24.5 knots at 2.100 rpm, flying like a much smaller, lighter boat. Fuel capacity of the 65 is impressive – 3.800 liters – and guarantees adequate autonomy no matter what your sailing ambitions are. Raphael 65 is one of the first new generation Italian navettas and an excellent star for her builder. Judging by what we have seen in terms of design and fuel economy, Raphael is looking to reshape the yachting habits of Mediterranean leisure cruisers, and we believe they just might be up to that task.